Details relating to the Portuguese Commemorative of 2014. This coin commemorates the 40th anniversary of the so-called “Carnation Revolution” which took place on 25th April 1974. When the soldiers entered Lisbon they were received enthusiastically by the people who put red carnations in the barrels of their rifles – hence the name. A large part of the army revolted against the dictatorship in Portugal. This prepared the way for democracy and the end of the violent colonial wars. Two curves running from around five o’clock to two o’clock and seven o’clock to ten o’clock form in the middle of the coin a stylized carnation. At the top of this carnation, around the top edge of the inner circle is the name of the issuing country and directly underneath that is the Portuguese coat of arms. At the bottom we see “40 anos” (40 years) – the time since the end of the dictatorship and thereunder the year of issue 2014. In the middle of the coin is “25 de ABRIL” and the script used is similar to that appearing on the posters that were used at the time of the revolution. 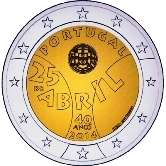 From Portuguese Commemorative 2014 to euro coin collector.